Fiddling around in the garden has become part of my morning routine. After coming back from dropping my daughter off at school I usually make tea and head outside. I water, pull weeds, prune the tomatoes and inspect the lettuce for holes. Sometimes I harvest something, but usually I am checking out bugs. I never realized how interesting it is to research all the cool bugs that are protecting and invading my garden. More than once I have ended up getting a sunburn on my winter-pale shoulders. Greens are one of my favorite vegetables to grow mostly because they are almost foolproof. In Summer I usually scatter a heat-resistant variety of seeds across a window box full of quality soil, provide partial sun, water everyday and enjoy salad all summer long. My friend recently told me that she couldn’t grow any vegetables in her apartment. Which is just not true! Growing on a sunny deck, rooftop, front doorstep or even in a window or window box is pretty easy. In 2007 I started my first veggie garden on my deck in an on-campus apartment in college. The deck didn’t even get afternoon sun, but I worked that deck to death. I bought two large inexpensive recycled cardboard pots from my local nursery, each about 2 feet wide and deep. Using companion planting methods I was able to get two tomatoes, a pepper plant, basil, radishes, loose leaf lettuce and spinach all into those two pots. There was even a squash growing in a smaller pot and a worm composting bin hiding under a table. When we moved to San Jose, a backyard with space for a garden was at the top of my must-have list. Our backyard is pretty small, but we have plenty of sunny space for gardening. Right now about half of our yard is dedicated to growing food eliminating my need to purchase vegetables from May-October. Awesome right? I ate my first garden salad of the season last week. It was crunchy, peppery, and full of flavor. 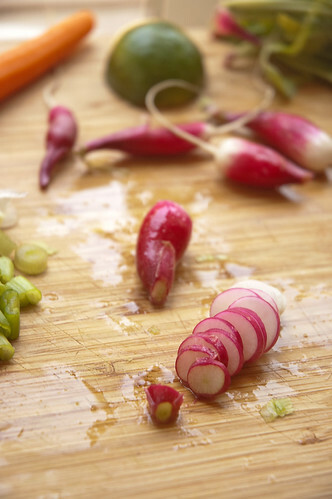 Food grown with your own blood, sweat and tears tastes a million times better than what you find at the supermarket. It’s almost like I get to eat all the love and care I pour into my plants. I challenge you to grow something edible this year. Cook with it often & be sure to tell me about it! Edible Garden Inspiration – Apartment Therapy’s collection of inspiring edible gardens. You Grow Girl – For people with less than ideal garden spaces. Life on the Balcony – Container gardening tips for apartment dwellers. 1. 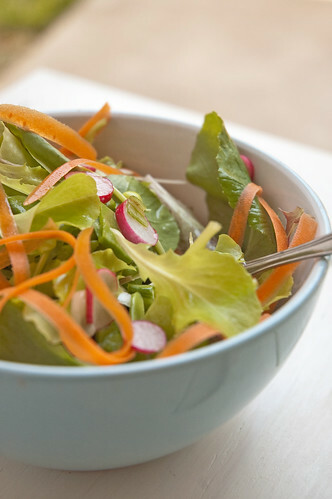 Toss the lettuce, peas, carrot, radishes, onion and a the juice of half a lime in a medium-sized bowl. Sprinkle the top with a little more lime juice, a drizzle of olive oil, and salt & pepper. *add a hard-boiled egg, beans, nuts, canned tuna, or cold cooked chicken to make a great light lunch. What a lovely post! And lovely photographs, too. We have been caring for our own little garden in our tiny patio for several months now and we have learned so much about what works and what doesn’t. Our early girl tomatoes are thriving. I just harvested spring onions the other day to garnish a rice porridge my mom made. And I’m about to pick some calamansi fruits (Filipino limes) any day now. It’s amazing what we can grow in such tiny spaces. 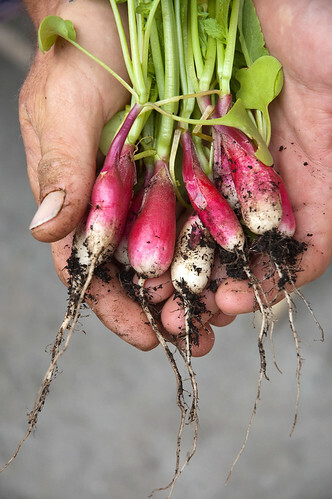 Your radishes look so delicious. We may have to try them out in our garden soon. Thank you for the inspiration! Aren’t those spring onions delicious! I love growing those. Didn’t grow any this year. Instead I went with shallots. I love using the tops in almost everything. I want to try a citrus in a container one of these days. Never grew fruit before 🙂 Well, tomatoes, but they barely count. 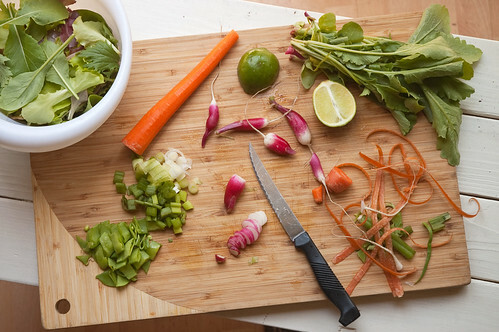 Nice blog – love the photos of your salads. We are growing coriander to go in our salads. Lovely. Isn’t that so rewarding to be able to make something out of produce you grew. 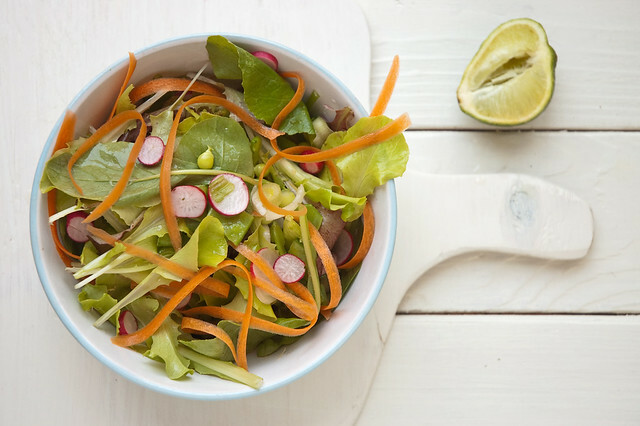 Beautiful photos and salad. 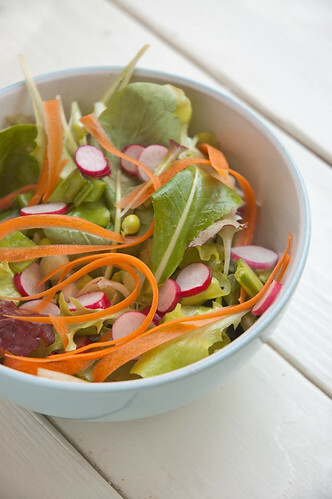 Love how delicious that salad looks! I agree 100% that eating food that you’ve grown yourself is so much more delicious and rewarding (not to mention easier on the pocketbook). So glad I stumbled across this!